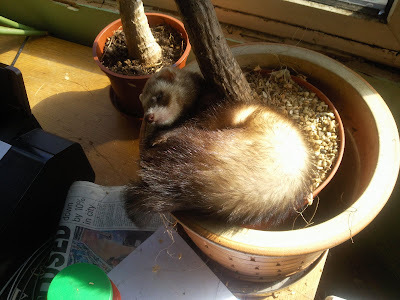 What a roller-coaster of a weekend, after the shock arrival of the new addition to the Remmer household (Minky the ferret aka Satan pictured above) it was off to Wales for the All Wales Pole Dancing Championships (AWPC) where I was judging. The drive should have taken about 5 hours but the M6 had other plans for me and at one point I managed a measly 12 miles in 1 hour thanks to the idiot who decided that he could pull out of a slip road without checking it was clear, his mistake resulted in someone else's death and and a huge tailback. 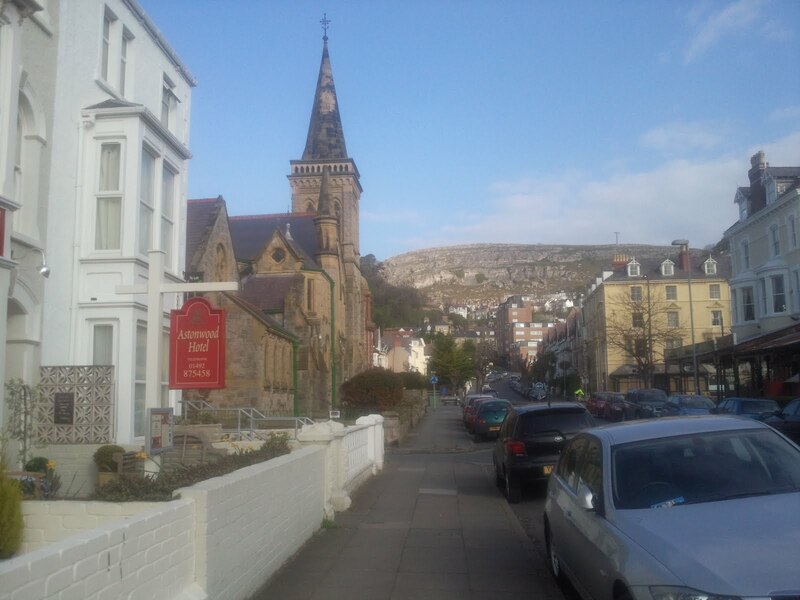 2 more accidents later and I reached Llandudno in the snail like time of just over 7 hours. Despite the horrific journey I have to say that the A55 is a stunning drive across the North Wales coast and was equally beautiful at 4pm as it was in the morning mist at 9am. Luckily the show was just starting as I arrived so I dashed to the judges table briefly perused the scorecards and watched the first performance by the lovely Karen Chaundy. I will be writing a review of the All Wales Pole Championships later this week for the Pole Dance Community site so watch their pole dancing magazine for full details. After the AWPC it was time to find a petrol station as the tank was off the red and then off to find the B & B that I was staying in. After a scenic tour of Llandudno and an unintentional detour the wrong way around the 1 way system I found both fuel and accommodation. The AshtonWood B & B looked so welcoming and I was ready to collapse and fall asleep immediately, however sleep proved elusive and instead I 'enjoyed' a night of insomnia due to no fault of the B & B and purely due to my restless mind and me missing my husband and menagerie. Breakfast was served at 8am and I joined the lovely Tracy Huckfield (organiser of the AWPC, Level 2 PDC approved pole dancing instructor and proprietor and principal instructor at Pagan's Pole), her husband and some other people from the AWPC. We enjoyed a lovely English Breakfast and had a chance to reminisce on the events of the previous night before it was time for me to depart to return to Plymouth. I was making excellent progress and was just thinking how the homeward journey was much more pleasurable than the outbound journey when just 25 miles from Exeter I saw the warning signs flashing, the traffic stopped at junction 26 and the A38 was brought to a standstill. After about 10 minutes I decided to take advantage of the unexpected stop and I climbed into the back of the car to change into a light summer dress, I then grabbed a newspaper and got out of the car and sat on the bonnet, others had started to share the idea and before long we had our own mini Summer festival with some getting out camping chairs, dogs being walked and teas being made in the back of a caravan that was still the right way up (unlike the one that caused the accident). I have to say it was the best traffic jam I have ever been in. For those of you who do make the M5 trip through to Bristol have you noticed (not sure how you could miss it) the new development adjacnet to the wicker man. The willow man, created by artist Serena de la Hey, used to enjoy the tranquillity of blue sky and green fields but no more, now he shares his environment with a building I am now calling Armageddon. Fortunately the willow man still retains his fabulous bottom :) N.B. The image above is actually a canvas that is available to buy from artist Tony Howell. There was more drama on the homeward journey when I got stopped for speeding in the service station car park, the officer who pulled me was obviously having a bad day and his attitude did not impress me, he could have simply asked me in a nice manner if my speed was correct but instead he chose to speak to me like I was piece of dirt which I felt was completely unnecessary. "Was that an appropriate speed for a car park?" he shouted, "I believe so" I replied knowing that actually the speeding laws for public highways do not apply for private car parks, "What speed were you travelling at" he asked " The same speed as you?" I replied, "Did you think it was appropriate to undertake me " Yes" I replied, I could see his frustration but I did not believe my speed was inappropriate for the circumstances and I was not about to be belittled by a grumpy highways officer who was obviously looking to take his anger out on an innocent driver. Finally after 6 and a half hours I was home ready to enjoy a cool, refreshing beer in the backgarden before getting ready for a night of glorious sleep on my most beautiful memory foam mattress and duck feather pillows! If you are about to make a motorway journey please stop and think about the safety of others, driving selfishly might not just end your life but might end the lives of other road drivers too. Think and drive safely!